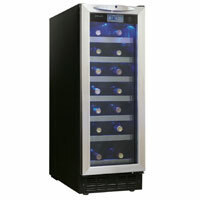 Perfect for entertaining or just displaying your favorite wines, the Danby DWC276BLS Wine Cooler offers storage for up to 27 bottles of wine. An adjustable thermostat with a range from 4°C to 18°C (39°F to 64°F) provides ideal storage temperatures for red, white and sparkling wines. 7 black wire shelves with stainless steel faces slide out for easy access to bottles. Suitable for built-in of freestanding applications. Comments: This wine cooler fits perfectly in the space that used to be occupied by a trash compactor. It looks very nice the way it lights up the wine bottles. We keep it cold for white wine and also keep bottles of sparkling water in it. My only complaint is that it is somewhat noisy. I don't like to hear the sound of it powering on and turning off repeatedly. This doesn't bother my husband at all, although I think he's slightly hard of hearing. Were it not for this one issue, I would have given it five stars. Comments: I was so happy to find one 12" wide! I was starting to think I was out of luck because I checked all the sites out there and wasn't finding anything, but when I called the guy at the Beverage Factory, he directed me to this one and the size was perfect. Now that I have it installed, I'm really happy with it. It looks great, I like the lighting system and it doesn't make much noise. Comments: When I took my trash compactor out this was the only wine fridge that would fit under my counter. When I got it home I was very happy with the look of the fridge and the nice stainless steel. The blue lighting really looks great and it's easy to set the temperature. It works great for me!